Canopy Parts 3/4" used a lot for indoor booths and canopies at Fairs, Swap Meets, Craft Shows, Art Shows, to hang banners and merchandise, also great for small projects. 10 x 10 Canopy is usually built with 3/4" pipe, uses 3/4" Electrical Metal Conduit (EMT) pipe available at your local hardware stores. 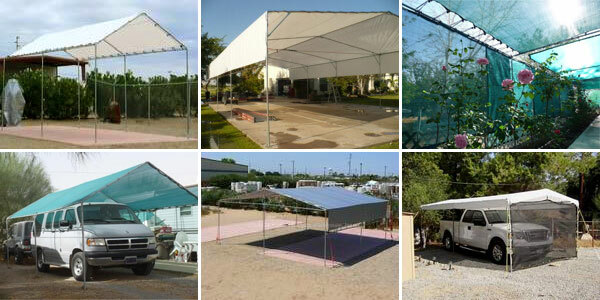 Canopy Parts 1" are best selling size by far, used to build Party Tents, Flea Market Booths, 10 x 20 Canopy, Shade Canopy and many other shelters, uses 1" Electrical Metal Conduit (EMT) pipe available at your local hardware store. Canopy Parts 1 3/8" this is the most common fitting in boxed Canopy Kits, also used to build Portable Garages, Car Canopy, Portable Carports, uses 1 3/8" Chain Link Fence Tubing available from fencing stores and some hardware stores. Canopy Parts 1 5/8" and Canopy Parts 1 7/8" or ideal for any Canopy Frame with legs higher then 8 feet or free span more then 20 feet or for wherever you want a Heavy Duty long lasting Canopy great to use for shade shelters for Horses, Rvâ€™s, Boats, Trucks, Cars. Useâ€™s 1 5/8" and 1 7/8" pipe available from fencing stores.